For 36 years, MAGIC has entertained audiences with music and magic throughout the upper Midwest. This year we start another chapter as we welcome Jeff Grimmer as our new lead, replacing retiring, but not shy, original member, Bruce Gray. Stan Bruss sings bass, Wayne Hughes is our tenor, and Doug Peterson (His Wizardship, as he insists on being called) does the magic and sings baritone. (We hope he gets it right!) 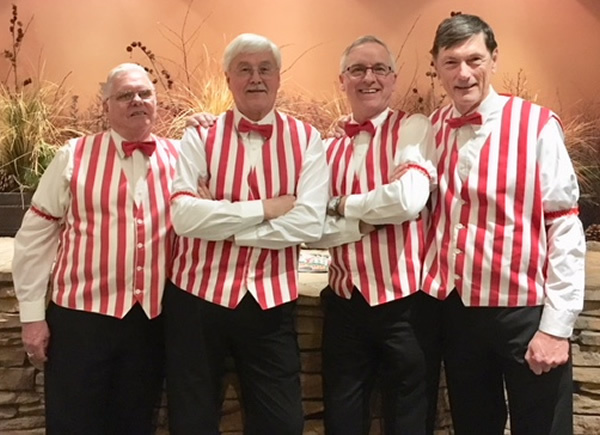 Magic has amazed audiences from Minnesota to Mississippi Rivers, and have traveled extensively throughout the world - Jeff has been to England, Stan to the Far East, Doug to Jamaica, and Wayne regularly goes fishing on Lake Crystal. Their reparation has far exceeded their grasp - from Doug's incomprehensible magic to the blend of four malodorous voices. They continually strive to reach the pinochle of success. From their humble beginnings 36 years ago, to their unexplainable renown today, it has truly been an Alger Hiss story!